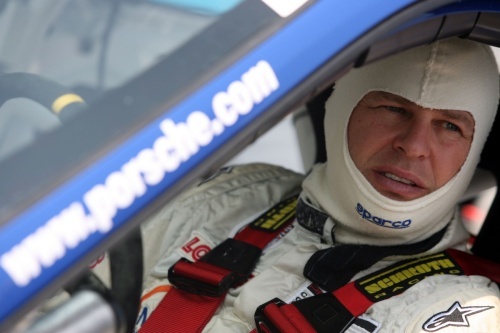 Tim Harvey enjoyed double Porsche Carrera Cup GB victories at Oulton Park yesterday (Sunday 6 June) when he won a shortened round eight of the championship. Tim driving for Red Line Racing, was ahead, but under constant pressure from fellow Member Michael Caine (Motorbase Performance), when the race was halted on the 12th lap following an accident involving Steve Parish (Addison Lee Motorbase) and Alex Martin (GT Marques). With the circuit curfew time fast approaching, there was no time to restart the race. Tim had got the jump off the line, but there was drama as the 27-car field headed for the first corner, Old Hall. Contact between the Team Parker Racing cars of Euan Hankey and Glynn Geddie sent Hankey's car spinning across the track and into the barriers on the left of the circuit. Their team mate Stephen Jelley had a miraculous escape as Euan spun immediately in front of him. "I was just hard on the brakes; he came right across my nose," said Stephen. That incident allowed Harvey and Caine to establish a small but important margin over the chasing pack. As ever, their cars were supremely evenly matched and they ran nose-to-tail for lap after lap as Michael looked for a way to pass his title rival. But any plans that he had for a late race bid were thwarted by the red flag with six laps to run. Tim duly claimed his seventh win from eight races and commented "I can't afford to be complacent, but I'm very, very pleased to come away with two wins".